They waited, and waited, and waited for the sight of a truck pulling a trailer to come up the road. When it did, they let out a collective whoop and high-tailed it up the lane way to greet the new arrivals. For Violet and Willie, it was love at first sight. Jude was drawn to Oliver. At one point, Jude seemed overcome with emotion and whispered earnestly, Thank you so much for getting us ponies! I reminded him to say it to Grandma Sue when she arrived later with a delivery of hay (sown and harvested by Grandpa), as it was her idea and gift for them. They stayed in the barnyard with their new friends until darkness and the cool night air forced them to say their good nights. Violet went to bed with my promise that I'd wake her extra early so that she could do the chores before school. I wish I could explain how I felt about it all. Hearing the satisfying munch of horses eating hay, the resonant clop of their hooves on our old barn floor, and the ancient sound of their whinnies as they greeted us in the pouring rain of early dawn satisfied the longing of decades. When I was in my twenties, I got a tattoo of three intertwined horses as a promise to myself that I would never let go of the dream of one day owning horses. Of course, the kids were late for the bus once I'd called them in and reminded them to wash their hands. At the end of the day, back packs were dropped by the fence, and before I could issue words of caution, they were out leading their ponies as if they'd been born with lead lines in their hands. I had some quiet moments in the barn by myself today, shoveling manure and cleaning out their hooves. My hands had that delicious horsey smell and I just had to get Oliver out for a walk down to the mailbox. I started to jog in my rubber boots and he picked up his pace to stay beside me. Imagine me running down the lane way like a younger woman, the wind on my face and the sure, steady sound of hoofbeats beside me! 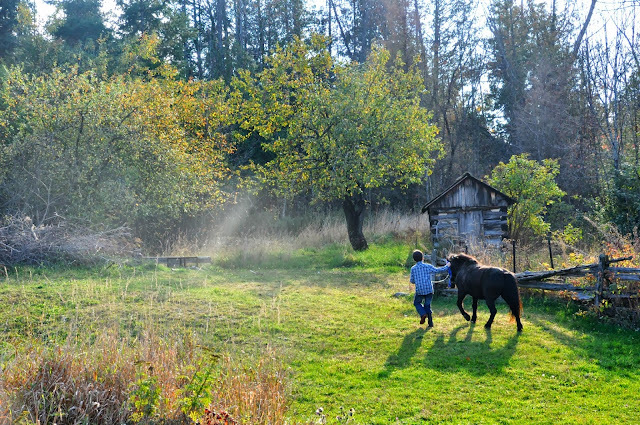 I just love that photo of Jude and Oliver with their backs to the camera and the gorgeous fall light, the old log shed and cedar fence....*sigh. * Stunning! The sweetness will never end for you and the children; thanks for sharing the love. Fabulous photos, and lovely new ponies !! You described it beautifully. delightfully marvellous and peaceful. thanks for sharing your description. I could hear it and smell it. Yippeeeee! I mean, yeehaw! I am so happy for you all. You are gonna *love* having these equine friends. 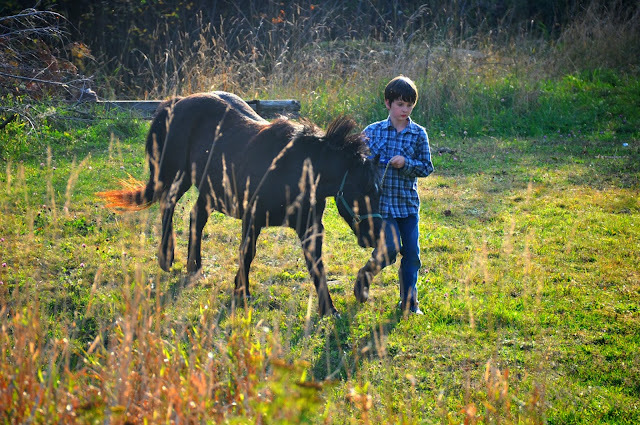 That photo of J running with the pony, the one where you used the rule of thirds (deliberate or not), is FANTASTIC. It makes me want to join in with them. So beautiful. And your crew sitting on the gate? - fabulous! I love M's outfit. Thank you for the beautiful picture! I do love the smell of horses too. So earthy and real.